If you are a regular reader of my blog then you may remember that recently I fell in love with Korres' Bergamot Pear Body Milk. It's such a beautifully scented, lightweight moisturiser, and it was only a matter of time before I bagged myself the accompanying body wash. 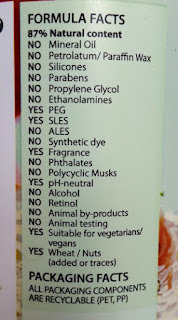 The Korres Bergamot Pear Showergel is an 87% natural product that is free of silicones, mineral oil, parabens, alcohol and more (see below), is also suitable for vegans and vegetarians and is not tested on animals. It is rich in Vitamin E, Vitamin C, zinc and antioxidant enzymes and also contains Active Aloe, an ingredient that has the "ability to stimulate collagen and elastin synthesis," helping to reduce the visible signs of skin ageing. It also claims to help boost the skins immune system. It comes packaged in a dark red/brown bottle (with the product information sticker wrapped around it) with a white flip cap that holds 250ml of product. The wash itself is a cloudy white colour with the same beautiful scent of the Body Milk. Apply to wet skin, massage into skin and rinse. You don’t need to use much of this to get a good lather. As with most other body washes, you get a better lather with a something like a sponge or a bath puff. Korres' Bergamot Pear Showergel lathers up well without needing to use too much and therefore spreads far, meaning that you don't need to use half of the bottle for one wash. It also rinses easily, so there is no long wait afterwards either. I find that it leaves the skin feeling cleansed and soft with a light scent to it. It doesn't dry out the skin at all. In fact, I find that it helps to prevent it well, keeping it well moisturised. It is also non-irritating, meaning that it will likely be suitable for those with sensitive skin (mine is fairly sensitive and mine doesn't get irritated by this wash at all). I can't really say much in regards to visible signs of skin ageing and whether or not that this really does help to reduce them as I'm still only in my twenties, but it does leave my skin with a healthy glow. 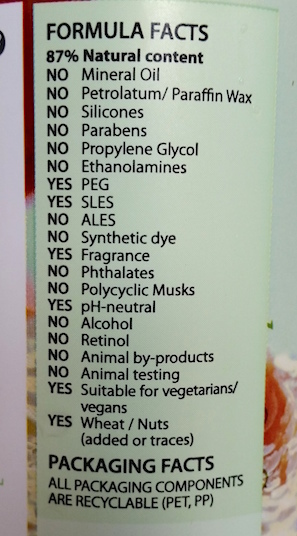 The only real downside is that it contains SLS (which is probably why it lathers up so well), so if you prefer your natural products to be SLS free then you may feel put off. However, if SLS is fair game, then this body wash is definitely a must try! Overall, I think that this is a great accompaniment to the Body Milk. It helps the scent to last longer throughout the day and together they leave the skin feeling smooth, clean, fresh and smelling great. If you like slightly unusual scents in your skincare, I highly recommend trying out the full range of Korres' washes, milks and body butters which you can find here. 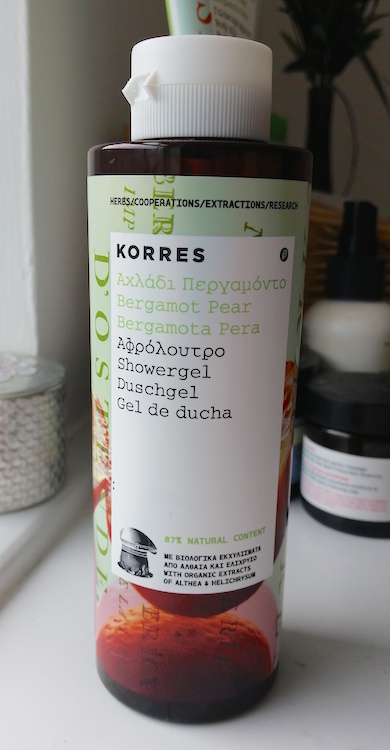 You can purchase Korres' Bergamot Pear Showergel for £8/250ml from Look Fantastic (and at the time of writing they have an offer of buy one get one free which you can get here - get it whilst you can!) or €10,30 from Korres. What are your thoughts on Korres' Bergamot Pear Showergel? What's your favourite Korres bodycare scent?